Omega-3 Fatty Acids, found mainly in fish oils, are thought to be beneficial for numerous medical conditions. The oilier fish, such as tuna, sardines, salmon, mackerel and herring, contain more fatty acids. Two long chain Omega-3 Fatty Acids, EPA (eicosapentaenoic acid) and DHA (docosahexaenoic acid) have been the subject of many medical studies. These essential fatty acids are natural anti-inflammatories. It is now becoming clearer that inflammation may be the common denominator of numerous medical conditions including Heart Disease, Hypertension, Diabetes, Alzheimer's Disease, Depression, Autism Spectrum Disorders, Dementia, and perhaps even Osteoporosis, Lupus, Rheumatoid Arthritis, Sjogren's Syndrome, Dermatomyositis, as well as Ulcerative Colitis, Crohn's Disease and Asthma. In an article in the Internal Medicine News of 2004 it was stated that, "All the evidence now suggests that inflammation may be a hallmark for depression as it is for cardiovascular disease, " and that, "depression is associated with low cell membrane levels of Omega-3 fatty acids, specifically DHA and EPA". Omega-3 fatty acids are an important component of nerve membranes and influence membrane fluidity, signal transduction, and enzyme function. Furthermore Omega-3 fatty acids are felt to be anti-thrombotic (preventing blood clots), and cause endothelial relaxation (the cells that line our blood vessels), as well reduce susceptibility to irregular heart rhythms. Notably the brain is an astonishing 60-percent fat and needs Omega-3 fatty acids to function properly. It is also felt that, aside from promoting cardio-vascular and neurological health, EPA and DHA promote joint health, gastrointestinal health, a healthy mood, glucose and insulin homeostasis, immune response, and bone, skin, and retinal health. By supporting healthy cell membrane structure, these Omega-3 fatty acids support cell receptor function and gene expression. As noted above, EPA and DHA are long chain Omega-3 (polyunsaturated) fatty acids which are produced from essential fatty acids that can not be manufactured in the body. Accordingly they may be consumed in the diet, such as eating cold water fish, or provided in supplement form. The typical American diet contains approximately 10-30 times more Omega-6 fatty acids, which are pro-inflammatory, than Omega-3 fatty acids. The high levels of methyl-mercury and PCBs found in fish have caused the government to publish certain guidelines on fish and seafood consumption. For instance by some FDA figures, eating two cans of canned albacore tuna per week would exceed the Environmental Protection Agency's safe range by 300%. The FDA recommended that children and women of childbearing age should limit fish consumption to 12 oz. a week and avoid such fish as tile fish, mackerel, king fish, sword fish and shark. It is therefore more advisable to obtain the majority of Omega-3 fatty acids from supplements that are purified of heavy metals and pesticides. As noted in the Archives of Pathology and Laboratory Medicine in 2003, "Fish are rich in Omega-3 fatty acids and their consumption is recommended to decrease the risk of coronary artery disease, however fish such as swordfish are also a source of exposure to the heavy metal toxin mercury. The fish oil brands examined in this manuscript have negligible amounts of mercury and may provide a safer alternative to fish consumption." As noted in the Cleveland Clinic Journal of Medicine in March of 2004, "The American Heart Association recommends 1 gram of long chain Omega-3 fatty acids per day for those with known coronary heart disease. People with no known heart disease should eat oily fish at least twice a week." In addition that same article noted, "Since mercury toxicity is mostly a concern for fetuses and breast-fed infants, the U.S. Food and Drug Administration's advice to avoid contaminated fish is directed primarily at pregnant women, those wanting to become pregnant, and nursing mothers." Recent research has also suggested that fish oil may be useful as an adjunct for weight loss. A study done in Australia and published in the American Journal of Clinical Nutrition suggested that when exercise was combined with fish oil supplements this led to a leaner body than simply exercise alone. Another study published in that same journal showed that mice which were obesity prone and fed high fat diets gained less weight when the diet was supplemented with fish oil. It is believed that the mechanism of weight loss is due to the up-regulation of intestinal lipid metabolism and quite possibly promoting lipolysis and apoptosis (death) of pre-fat cells. As noted previously, fish oil supplementation may prove beneficial for numerous neurological conditions, including depression, dementia, autism spectrum disorders, bipolar disorder, and schizophrenia, in addition to multiple sclerosis. In an article published in the Internal Medicine News in 2002 it was noted that when a fish oil diet was combined with Ginkgo Biloba supplementation, the patients treated showed significantly less disease progression in the active treatment group, and demonstrated a beneficial effect upon memory, attention, and functioning. In an article published in the Archives of General Psychiatry in 2002 it was concluded that, "Treatment with EPA/DHA at a dosage of 1000 milligrams a day was effective at treating depression in patients who remained depressed despite adequate standard therapy". In another article published in the Journal of the American Medical Association in August of 2004 it was concluded that, "Major depression is strongly associated with increased levels of CRP among men and could explain the increased risk of cardiovascular disease associated with depression in men." Notably CRP is a marker of inflammation. Another interesting study was documented in the Newsweek article in 2001 in which 30 bipolar patients were treated with either 10 grams of Omega-3 fatty acids or placebo. The patients receiving the fish oil supplementation improved so much better that the study was discontinued and all patients were switched over to fish oil supplementation. In that same article it was noted that doctors have also gotten impressive results using fish oil supplementation in patients with schizophrenia as well as depression. While EPA and DHA are found almost exclusively in seafood it is interesting to note that fish actually do not produce them. It is the single-cell marine organisms that fish eat which actually produce these oils, and so they are not only essential for fish but for human beings as well. There are additional sources of DHA which have been found including some fungal and algae sources. Alpha-linoleic acid, which is also an Omega-3 fatty acid, is synthesized in the chloroplasts of leaves, as well as seed oils. Flaxseed oil is one rich source, in addition to Camelina, Chia, and Peria oils, as well as Olive oil, Canola oil and Soy bean oils. Alpha-linoleic acid is also found in nuts, primarily walnuts. Alpha linoleic acid is actually a precursor in the production of DHA, however only approximately 1-9% of Alpha linoleic acid is actually converted into DHA. The question then remains of what dosage to use for specific benefits. Most of the studies have examined doses ranging from 1000 milligrams up to 20,000 milligrams a day. Doses ranging from 3 - 20 grams a day have been used in studies for benefits on blood lipids (notably triglycerides) platelet function, blood pressure, blood vessel flexibility, inflammation and endothelial function. One study suggested that 1500 milligrams a day of EPA/DHA appeared to stabilize carotid artery plaques. There is less information available on the effects of lower intakes, less than 1000 milligrams a day. The American Heart Association recommends 1000 milligrams of EPA/DHA a day for patients with coronary heart disease, as well as recommending eating oily fish twice a week or 500 milligrams per day for patients without any known heart disease. In order to lower triglyceride levels doses need to be increased from 2000-4000 milligrams a day. As noted above, bipolar patients responded to higher doses of 10,000 milligrams a day. Finally there are concerns about toxins in fish as noted above, including mercury and PCBs. Fish on the top of the marine food chain can bioconcentrate mercury. Fish oil capsules contain no mercury, which is water soluble, not oil soluble, so that when the oil is extracted from the fish, the mercury as well as other heavy metals, including lead and cadmium stays behind in the fish meal. 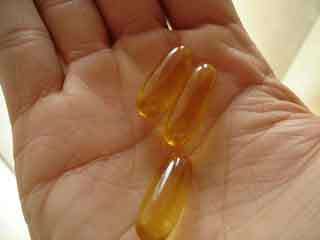 A consumer report examined 16 different brands of fish oil capsules and concluded that the EPA and DHA amounts found were reasonably close to their label claims and that all were free of pollutants. It should also be noted that while farm fish and wild fish are both good sources of Omega-3 fatty acids, farm fish may contain higher amounts of organic pollutants, since the fish oil put in their feed is not purified in the way that supplements are for human consumption. Wild salmon, which is caught earlier in their journey upstream to spawn, are richer in oil. As the fish make their way upstream their fat stores are utilized for energy. In conclusion it appears that Fish oil may have many diverse benefits which are currently emerging with ongoing research.